Alexios II was Byzantine emperor from 1180 to 1183. He was the son of Emperor Manuel I Komnenos and Maria, daughter of Raymond of Poitiers, prince of Antioch. 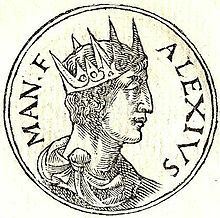 On Manuel's death in 1180, Maria, who became a nun under the name Xene, took the position of regent She excluded her young son from power, entrusting it instead to Alexios the prōtosebastos (a cousin of Alexios II), who was popularly believed to be her lover. Friends of the young Alexios II now tried to form a party against the empress mother and the prōtosebastos; Alexios II's half-sister Maria, wife of Caesar John (Renier of Montferrat), stirred up riots in the streets of the capital. Their party was defeated on 2 May 1182, but Andronikos Komnenos, a first cousin of Emperor Manuel, took advantage of the disorder to aim at the crown. A betrothal in 1180 of Alexios II to Agnes of France, daughter of Louis VII of France and his third wife Adèle of Champagne and at the time a child of nine, had not apparently been followed by their marriage. Andronikos was formally proclaimed as co-emperor before the crowd on the terrace of the Church of Christ of the Chalkè, and not long afterwards, on the pretext that divided rule was injurious to the Empire, he caused Alexios II to be strangled with a bow-string in October 1183.